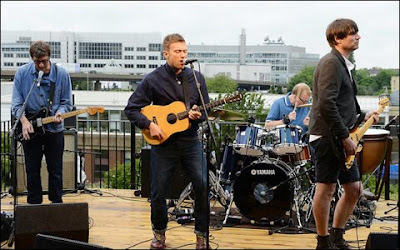 Blur premiered two new songs - Under The Westway and The Puritan - on a Twitter live stream last night. Surprisingly, they're not absolutely horrid. Under The Westway is the better track, a love letter to London (as seen from the aggressively grey Westway trunk road) that brings to mind the bruised majesty of This Is A Low and The Universal. The Puritan is more uptempo, with Damon sneering a disjointed lyric about the numbing pace of modern life. The tune is rather thin - but Graham Coxon's frantic, squalling guitar line saves the chorus. Both songs were written for the band's Hyde Park Olympic show, and will feature on the genuinely exciting Blur 21 box set, which comes out in July. You can hear the two tracks below. Under The Westway's visuals scroll through the song's sheet music, which is the best innovation in lyric videos for about five years. But can we have the guitar tablature next time, please?